This Internet-Draft will expire on February 23, 2009.
alerted me to other proposals for using bit 48 of the IPv4 header. any other proposals concerning bit 48. The first CES proposals were known as "Locator / ID separation"
barriers encapsulation presents to RFC 1191 PMTUD [Ivip-PMTUD-Frag]. Six/One Router [SixOneRouter] - which is not practical for IPv4. complexity in the translation routers. source and destination addresses are unaltered. between the ITR and the ETR. 3. Traceroute is expected to work over the entire path. routers could be upgraded with a firmware update. the destination host with the reassembly task. ready to switch to EAF as soon as the routers have been upgraded. straightforward PMTUD are very significant. whenever the core and internal routers are able to support it. packets into smaller than 1500 byte fragments [Ivip-PMTUD-Frag]. There are two reasons for these restrictions. fragmented en-route to the ETR. servers sending DF=0 packets of up to 1470 bytes long. assuming the host has sufficient CPU and memory capacity to spare. Such ITFH (ITR Function in sending Host) hosts cannot be behind NAT. still sending fragmentable packets across the core. in the ITR and ETR. reaching the router where the MTU limit was exceeded. what has to be done in a map-encap system to support RFC 1191 PMTUD. core-edge separation system is deployed. the core and rely on OITRDs to do the encapsulation. to hosts in SPI end-user networks, via OITRDs. with all its attendant complexities to handle PMTUD. scalable routing solution is not necessarily prohibitive. 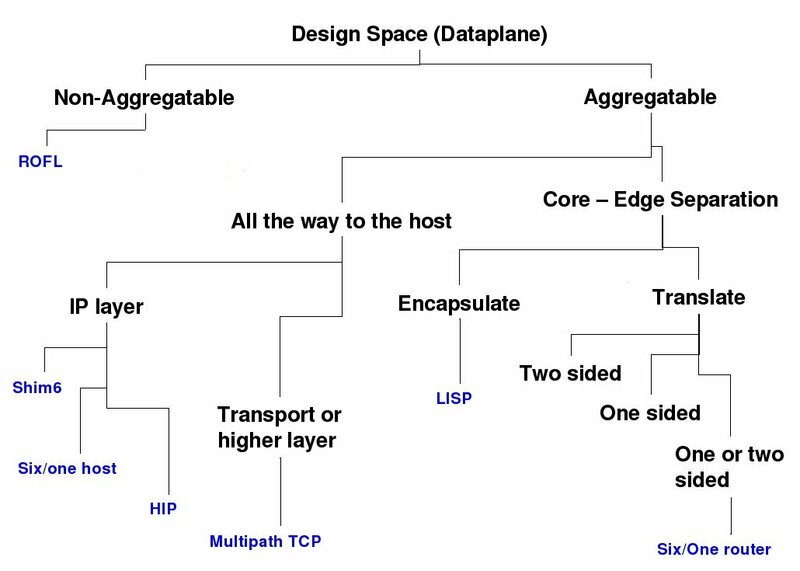 routing system or in map-encap. draft-farinacci-lisp-08 (work in progress), July 2008.
the following exhaustive discussion indicates. invalid, due to bit 48 being set. no record of the ITR address in the packet. TRRP uses GRE encapsulation - an IP header followed by a GRE header. the address of each ITR which was tunneling packets to it.